This is an update of an earlier proposal (2009), for a new rail line south-east from Tirana (Tiranë). 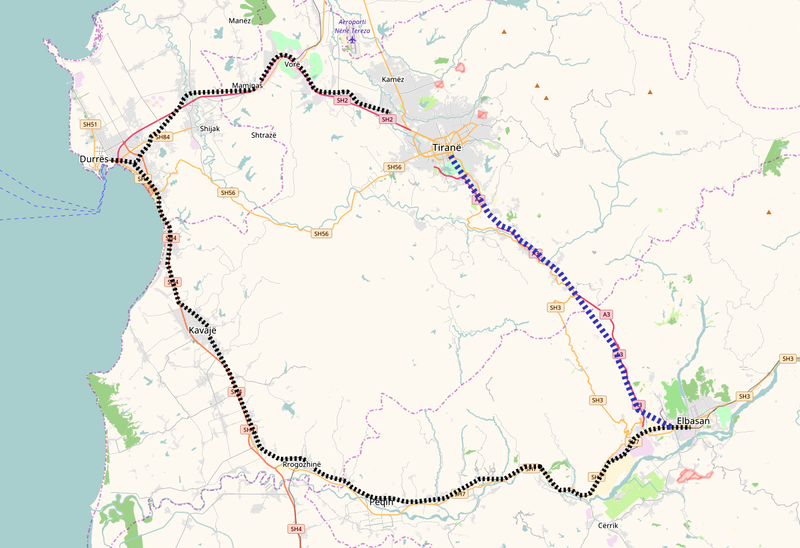 The line would extend the proposed Shkodër – Tirana line, and could ultimately form part of a high-speed route toward Lake Ohrid and Thessaloníki. Even without further extension, however, proximity and combined population justify a new line Tirana – Elbasan. Since the first proposal in 2009, a motorway between the two cities has been largely completed. The new line would closely follow this A3 motorway. Although Albania’s rail system has been de facto abandoned, there was a rail connection between Tirana and Elbasan. It was very indirect, because a tunnel under a mountain range was beyond Albania’s limited resources. Tirana is not on the coast, but it is on the edge of the central plain, where Albania’s population is concentrated. Elbasan is further inland, but located in the broad Shkumbin valley. The journey from Tirana to Elbasan started in the opposite direction, to the port city of Durrës. From there, the rail line runs south along the coast, and finally eastwards along the Shkumbin valley. The communist-era railway was extended to the shore of Lake Ohrid, but never even reached its planed terminus, Pogradec, let alone Macedonia or Greece. Tirana had 420 000 inhabitants at the 2011 census, although the agglomeration is now substantially larger. The Elbasan municipality had 142 000 inhabitants. The cities are separated by a mountains, with a maximum elevation of 930 m. The new motorway climbs to a relatively short tunnel, but a railway cannot climb steeply: it must enter tunnel at a lower elevation, and the tunnel will therefore be longer, about 10 km. The proposed new line from Shkodër would end at a new underground terminal station in central Tirana, which is at about 110 m elevation. The design should allow for a south-eastern extension, also in tunnel, parallel to the boulevard Dëshmorët e Kombit. 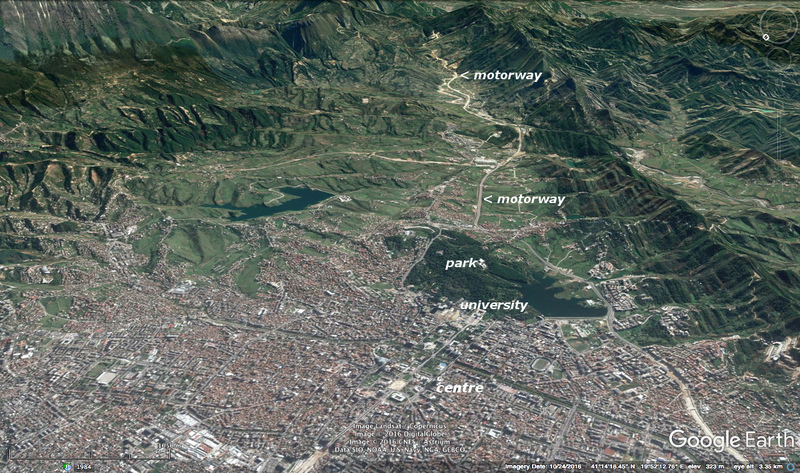 It would pass under the university zone and park, which are on higher ground at about 150 m elevation. The line would emerge alongside the motorway on relatively level terrain, at the edge of the built-up area. The line would then enter tunnel again, under a ridge, emerging at the village of Mullet. It is now in the valley of the Erzen River. 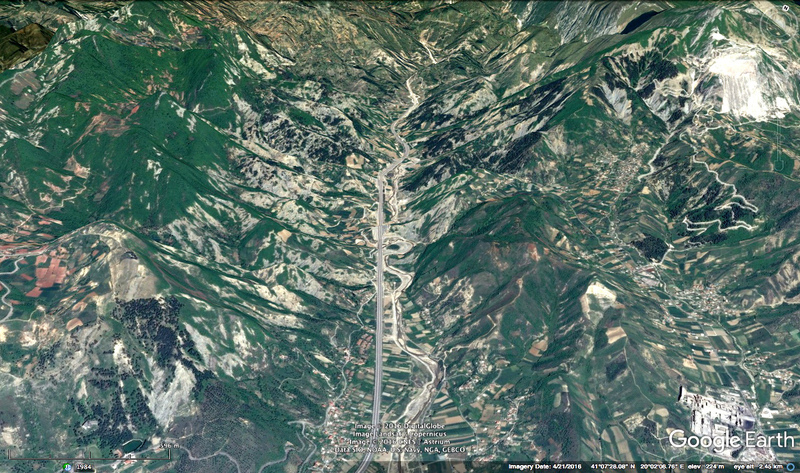 The main valley southeast of Tirana is a tectonic feature, and quite broad, but the valley floor of the Erzen itself is narrow. It is intensively farmed, and some demolition is inevitable. The new railway would run alongside the A3, which itself parallels the old main road. At the village of Ibë, the motorway leaves the Erzen, and follows a tributary valley toward the main Krrabë ridge. The motorway crosses this ridge in tunnel, into the Shkumbin valley. The tunnel portal is at about 500 m elevation, but the rail tunnel would start at about 225 m, and that means it would start closer to Ibë. The southern portal of the tunnel would also be at about 225 m, in the valley of the Kusha, a tributary of the Shkumbin. These constraints mean that the rail tunnel will probably pass under the motorway tunnel, but that is not a problem in itself. If geological conditions are unfavourable, a longer tunnel might be needed, with more difficult approach lines. In the most favourable case, the tunnel would be 9 km long. The southern portal would be near the Mamël-Dopaj exit on the motorway. The line can run very close to the motorway, but not directly alongside it because of the curves. Possibly several short flank tunnels would be needed here. 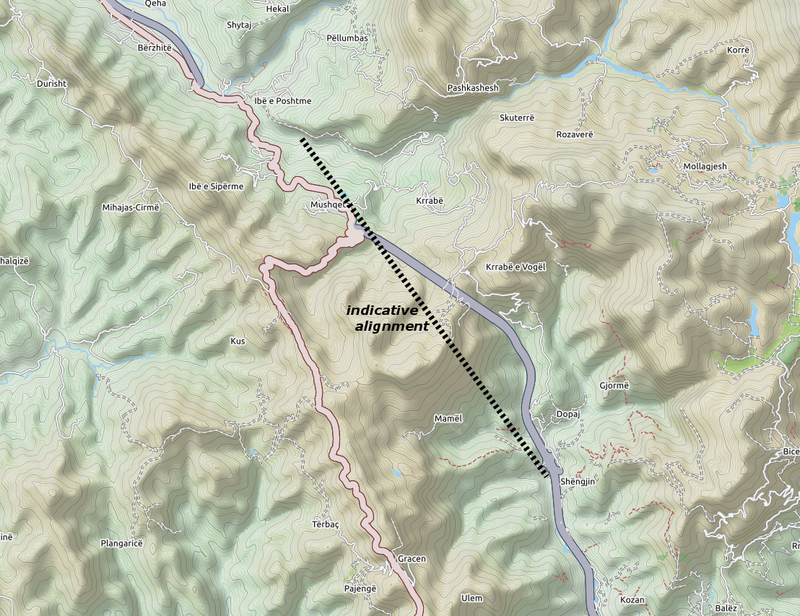 About 3 km further on, the Kusha valley is wide enough for a straight motorway alignment, and if the gradient allows, the railway can exactly follow it. At Shijon, the line would turn away from the motorway, turning about 80 degrees to join the existing alignment. From there, it is only 3 km in a straight line to Elbasan station, which is itself about 1 km from the city centre. The new line would be about 35 km long, station to station. It would carry passenger trains only, which allows for steeper gradients. Even in that case, the line will not allow very high speeds, and a journey time of 20 minutes would be reasonable. The existing indirect route via Durrës would be upgraded. The route to Durrës would be improved in combination with the proposed new exit line, toward the airport and Shkodër. The line from Durrës to the Shkumbin is also the route to southern Albania, so there is no reason to abandon it. The section along the Shkumbin valley, from Rrogozhinë to Elbasan, would be retained for freight – most traffic will be to Durrës, not Tirana. This section might also carry a Durrës – Elbasan regional service.